reviewed in the Bibliography as Higuchi 1926. The article also appears in Takahashi 1986. Yoshiiku, who was mild, open, and always tossing out puns, also had a very attentive side but lacked firmness. As he had come to establish his family from poverty, he had compassion for people, and he looked after those who attached themselves to him without regard to whether they were of good or bad character. Having put himself up in a fine house and being the president of a newspaper company there were many parasites, and he was eaten into by ticks of one kind or another, and they caused him no small amount of trouble. His family life was peaceful, but after leaving newspaper work he made mistakes in how he managed his life and fell into miserable circumstances. With one misfortune after another, his later years found him increasing thrown into the whirlpool of a backflow and ignored by society. He moved many times, and everytime he sunk deeper into the abyss, and without the influence he had at one time, on 6 February 1904 he went down [died] in a temporary residence in Taiheicho in Honjo [now Kinshicho in Koto-ku]. He was 72 . His Buddha name is Juzen'in Yoshiiku Nikkaku Koji, and he was buried at Nichirenshu Anseiji in Yoshinocho in Asakusa [now Higashi Asakusa 1-chome in Taito-ku]. But in 1910, Anseiji merged with Seitaiji in Kiyoshimacho in Asakusa [Kita Kiyoshimacho is now part of Higashi Ueno and Minami Kiyoshimacho is now part of Moto Asakusa] and the combined temples were called Toitsukaku. A cemetery was built in Kanigakubo in Shigai Ikebukuro [now Ooyama Kanaicho in Itabashi-ku] and the bones of the Ochiai family were also moved to Toitsukaku. Yoshiiku had six sons and four daughters, all children of his second wife Eijo. The only child to follow their father's profession was the last son Rokuro, but he also departed [died]. All other children except the third son had gone down. The two-tier tombstone has a family crest of three oaks engraved in a circle and is deeply engraved 落合 [Ochiai]. Even the incense and flowers are sparse and evoke a sense of pity, but finding that the Buddha names of Yoshiiku and his wife or even Yoshimaro are not engraved on the tombstone is immeasurably moving. Rokuro, by the way, was called Yoshimaro. He was talented with a brush, having come from the gate of [studied under] Tomioka Eisen [(1864-1905), a disciple of the Kano school drawer Kobayashi Eitaku (1843-1890)]. 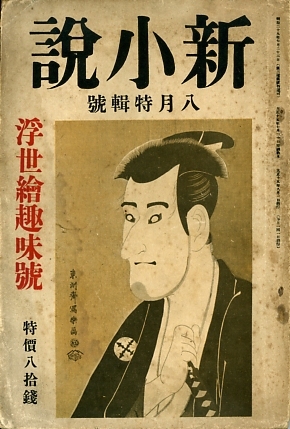 For a while the programs for new-school dramas in Tokyo became Yoshimaro's dominion, and finally there was an inclination of progress, but on 29 August 1914 he went down from illness. He was 30. His Buddha name is Honjoin Jutoku Nikkan Shinji.